Well, we had to see this coming, right? Given that Guardians of the Galaxy's Dave Bautista has made it his life to get himself fired from the franchise because of the way Disney fired James Gunn, the actor has taken the logical next step. With Gunn moving on to Marvel's rival Warner Bros. to write and possibly direct a Suicide Squad "sequel", Bautista is making it clear where he'd much rather be. Hint: it's not with Disney. Well, Bautista's not a man to mince words, is he? How Marvel plans to react is anybody's guess but we have to assume they are getting pretty tired of Bautista constantly sticking a thumb in their eye. We've heard rumors of big changes to Avengers 4 that could affect his character, but he's still under contract and Marvel doesn't have to do anything. 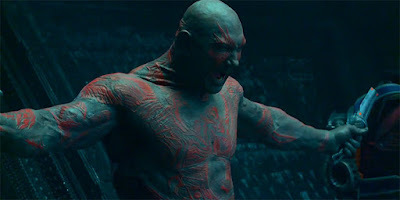 And we have to imagine that Gunn and Warner Bros. would kill to have someone as popular as Bautista on board. This whole situation has actually made him and Gunn more of a hit with fans, not the other way around.